It’s that time of the year yet again as professionals and horologists from the dynamic world of fine watchmaking converge in chilly Geneva to experience the exquisite offerings of this year’s Salon International de la Haute Horlogerie (SIHH). Now in its 29th edition, this immersive watch fair highlights not just the latest timepieces but also provides valuable insight on the upcoming trends and cutting-edge creative watchmaking from the participating Maisons and independent brands. Held from January 14 to 17 this year, here’s a summary of the stellar novelties that will set the tone for what will grace the elegant wrists of the social set in the months to come. Never one to rest on their laurels, the masters of luxury watchmaking and clock creating have truly outdone themselves this year by presenting a brand new gyrotourbillon model that promises to be the most wearable one yet. Christened as the Master Grande Tradition Gyrotourbillon Westminster Perpétuel, this every day timepiece comes equipped with perpetual calendar and significantly smaller tourbillon meant to reduce error tolerance. Adding to all this charming complexity is the minute repeater that will strike every quarter hour to an uplifting tune which replicates the chime of London’s iconic Big Ben clock tower. One can always depend on the likes of MB&F to continue to keep things interesting with their own unique take on timekeeping. With the new Horological Machine No 6 Final Edition, the independent watchmaker has decided to boldly go where no man has gone before by presenting a stainless steel timepiece that can be best described as a ‘cosmic spaceship from the future’. Comprising a grand total of 475 components, reading this otherworldly creation is as simple as viewing the Super-LumiNova numerals and markings placed on the conical gears which are housed in separate spheres that represent the hours and minutes. 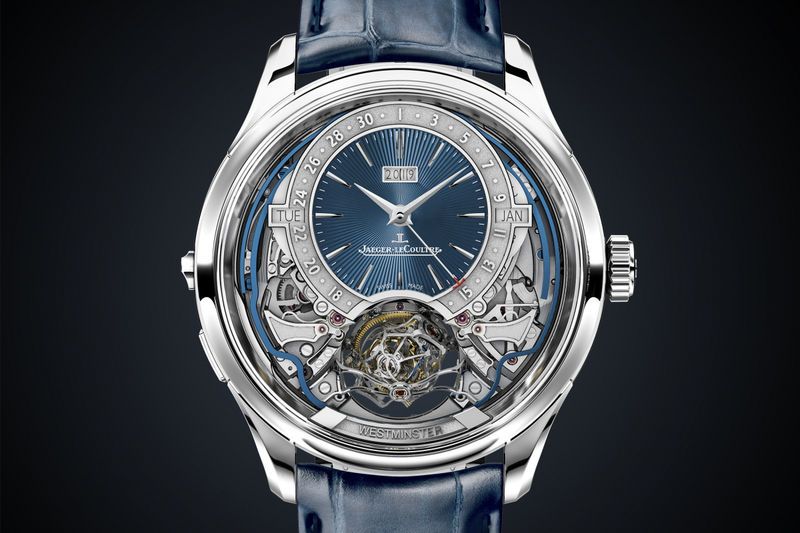 At the centre of this masterpiece is a sapphire crystal dome that displays a flying tourbillon, which can also be concealed via a retractable dome. It’s certainly not every day that one gets to be part of a major milestone for one the greatest classic timepieces to have appeared in the 20th century. To commemorate the silver jubilee of the iconic LANGE 1 by A Lange & Söhne, the German watchmaker has decided to release a limited edition version of the award-winning timepiece the has long been coveted by serious collectors for its asymmetric dial, outsized date display and phenomenal movement. Limited to just 250 pieces, the “25th Anniversary” edition of the LANGE 1 comes complete with a protective hinged cuvette in solid gold hand-engraved with an image of the manufacture’s historical headquarters in Glashutte. The rebels of fine watchmaking have returned this year with the Code 11.59 collection that will have collectors doing an instant double-take. Instead of classic design hallmarks such as the octagonal bezel and distinctive tapisserie dial, this exciting 13-piece collection represents as a new chapter in the manufacture’s storied legacy. Each creation in the collection features an octagonal middle case paired with brushed lugs that blend seamlessly with lines of the bezel and the curved sapphire glass. Modern and elegant, the new Code 11.59 collection serves as a reminder for Audemars Piguet’s incredible ability to merge avant-garde technology with over 140 years of watchmaking savour faire. For after all, the only way to break the rules is by learning how to master them first. Renowned for its exceptional professional diving watches, Panerai adds to its ever-growing collection this year with a sporty new model that pays tribute to the inspiring life of French free-diving world champion Guillaume Néry. Water-resistant for up to 300 metres, the Submersible Chrono Guillaume Néry Edition is an ultra-light titanium timepiece that comes equipped with a P.9100 automatic calibre with a power reserve of three days. Other distinctive features displayed on its 47mm case include a unidirectional rotating ceramic bezel for accurately displaying the duration of the dive, while luminous white markers and hands remain legible which can be a real lifesaver should one ever decide to tackle the elements that reside in the great deep and beyond. The luxury Swiss watchmaker continues to defy the status quo with. The release of several new additions to the iconic Freak collection. Highlights include the FREAK X, a 43mm timekeeping wonder available in a variety of captivating materials including classic titanium, gorgeous rose gold, sleek black DLC and high-tech Carbonium — a major first in the entire watch industry. Used to construct various vital components found in modern airplanes, other qualities of this high-performance material include a 40% environmental impact as compared to other composites. The result of this grand venture is a unique timepiece designed with the next-generation in mind that not only presents an unparalleled resistance-to-lightness ratio but also a stunning marbling effect that never repeats, ensuring that every watch case is truly one-of-a-kind.